Trees have been felled at the Thirlestane Castle Estate in Lauder. Bosses at a country estate in Lauder have assured residents that a programme of tree felling currently underway is necessary, and being undertaken following professional advice from foresters. Concerns were raised in the town after dozens of trees were felled within the Thirlestane Castle estate, which forms part of the Lauder Conservation Area, last week. 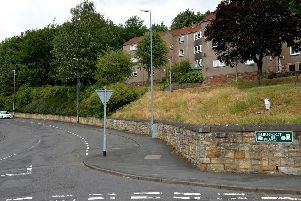 Lauderdale community councillor Stephen Potts said several residents contacted him after work started to remove trees on the castle side of the Castle Wynd wall, which forms the estate boundary. Mr Potts said: “Last week I spoke, in my capacity as a Lauderdale community councillor, to at least 10 members of the public who live near Castle Wynd about the substantial tree felling currently underway on the other side of the Castle Wynd wall. “Large numbers of healthy young beech trees had already been taken down, as well as quite a few mature healthy trees, again mainly beech, some of which must be 100 years old. However, estate bosses have explained that the trees are being removed to protect the ancient high boundary wall, which is specifically named as an important feature of the conservation area. James Barnes, chairman of Thirlestane Castle Trust, told us: “Through a request of the Lauderdale Community Council and people in Lauder, Thirlestane Castle Trust was asked to repair the estate wall. “The main cause of the deterioration of the wall is due to tree roots. In high winds, the trees sway and the roots move which causes structural damage to the wall. The wall is listed and we are required to ensure the structure is kept safe and in a good condition. Mr Barnes said that some of the hard wood trees also had to be felled because they were dying back and rotten in the middle. “The risk being that in a matter of years these trees could blow down and cause severe damage,” he explained. He added that any trees with birds nesting in them will be left to avoid damage to wildlife. “We have taken professional advice and this is the course of action has been recommended,” Mr Barnes said. Leaderdale and Melrose councillor David Parker said that Scottish Borders Council was satisfied that the works undertaken complied with the felling licence. He added that there will be replanting, and that the work, as well as protecting the wall, was part of the good woodland management of the estate.